This long-established and distinguished surname, having no less than seventeen Coats of Arms, and with several notable entries in the "Dictionary of National Biography", is of Old Scandinavian origin, and is a locational name from any of the various places in Northern England and Southern Scotland that get their names from the Old Norse "kross", cross (usually a stone cross set up by the roadside or near a settlement), and "byr", enclosure, settlement. 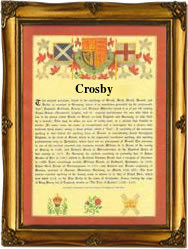 These places include: Crosby near Maryport in Cumberland, also Crosby upon Eden, and High and Low Crosby in that county; Little Crosby in Lancashire, recorded as "Crosebi" in the Domesday Book of 1086; Crosby Garret (Westmorland); and Crosbie in Ayrshire. Early examples of the surname from Scotland include: Iuone de Crosseby, who witnessed a charter by Robert de Bruys to Arbroath Abbey, circa 1178, and Walterus de Crosby, a charter witness at Lamberton in 1332. In 1379, one Thomas de Crosby was entered in the Poll Tax Returns of Yorkshire, and in 1383, Henry Crosseby, witness, was noted in the Assize Court Rolls of Warwickshire. Sir John Crosby was sheriff of London in 1470, and Brass Crosby, lord mayor of London (1770), became president of Bethlehem Hospital in 1772. Early namebearers to settle in America were Symon Crosby, aged 26 yrs., his wife, Ann, aged 25 yrs., and son, Thomas, aged 8 weeks, who embarked from London on the ship "Susan and Ellin" bound for New England in April 1635. The first recorded spelling of the family name is shown to be that of Gillemichel de Crossebi, which was dated 1176, in the "Pipe Rolls of Westmorland", during the reign of King Henry 11, known as "The Builder of Churches", 1154 - 1189. Surnames became necessary when governments introduced personal taxation. In England this was known as Poll Tax. Throughout the centuries, surnames in every country have continued to "develop" often leading to astonishing variants of the original spelling.